What a tremendous game that was in Pittsburgh yesterday! We were happy to have been on the Capitals First Period Moneyline so we could just sit back and enjoy the back-and-forth scoring without stressing out about how it would affect our wager. This month, and this season really, has been a textbook example of why we’re such big advocates of flat betting (using a similar unit size for all bets). Our Best Bets are the picks we like the most, but we’re just 25-24 on those for the season, compared to 233-184 on all our picks overall. Part of that may be small sample size, part of that could be that we didn’t start including Team Totals and First Period lines in our Best Bets until recently (they’re 17-12 since the start of December), and part of that might be that we’re just picking the wrong games to feature. Regardless, it just reinforces the importance of risking a similar amount on every bet, rather than doubling or tripling up on the ones we like the most. We make this point just in case any of you are only paying attention to our Best Bets and ignoring the rest. Alright, on to tonight where there are 9 games on the NHL schedule. Below’s our favourite bet of the day (again, take it with a grain of salt), along with stats, trends and tips for the rest of tonight’s action. Unders aren’t fun but we think there’s a pretty good edge here so we’ll take a shot. As we’ve said before, there’s a huge difference between 5 and 5.5 when it comes to NHL totals, and whenever we see a 5.5 or higher we’ll look to see if there’s value on the Under. The Blues finally got sick of seeing Jake Allen’s swiss cheese impressions and have turned to Carter Hutton in net. Since they made the switch, they’ve allowed 1 goal in 2 games (after allowing 30 in their previous 8), and it’s pretty telling that they’re giving him his 3rd straight start here. Tonight, Hutton faces a Senators squad that has scored 2 regulation time goals or less in 4 of its last 6 outings and 5 of 8. St. Louis had been lighting up the scoreboard for a long stretch this season but that may be slowing down a bit. They’ve been held to 2 goals or less in 5 of their last 10 games. They’re also playing their 3rd game in 4 days and 4th in 6 and coming off a west coast road trip, so the offensive energy might not be there as much tonight. And the Senators are playing decent defensively, allowing 2 regulation time goals or less in 4 of 6 games themselves. The Under is 12-4-3 in the last 19 meetings, and 5 of the last 6 Ottawa/St. Louis games have been decided in OT. That suggests a tight-checking game tonight, where a 2-2 tie going into OT would cash our ticket. For this game to go Over 5.5, either both teams need to get to 3 goals or one needs to score 4. We’ll take our chances. Reasons to bet Dallas: The Stars have been scoring plenty of goals lately, potting 3+ in 5 of their last 7 games and 7 of 10. New York has allowed 4+ goals in 4 of its last 5 games and has lost 3 of its last 4 at home. Reasons to bet New York: The Rangers have beaten Dallas in 5 of the last 7 meetings, including 2-0 Dec. 15 in Dallas. The Stars have lost 6 of their last 8 overall and 10 of 13 on the road. Reasons to bet Carolina: The Hurricanes have scored 21 goals in their last 4 games, winning all of them. The Blue Jackets have lost 4 of 6 since their 16-game winning streak. Reasons to bet Columbus: The Blue Jackets are 16-4-1 at home this season. Carolina’s 6-11-6 on the road, where the Hurricanes have scored 8 goals in their last 4 games. Reasons to bet Buffalo: The Sabres are 4-2-1 in their last 7 games. Toronto is playing its first home game in 10 days, and has lost 6 of its last 8 games at home. 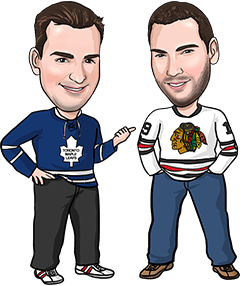 Reasons to bet Toronto: The Leafs are 8-1-1 in their last 10 games, scoring 4 goals or more in 7 of those 10 contests. Buffalo has lost 13 of its last 16 visits to Toronto and is playing its 4th game in 6 days. Reasons to bet New Jersey: The Devils are 2-0-1 on their current 4-game road trip and 4-2-2 in their last 8 games. Minnesota could let down here after facing the Blackhawks, Stars, Canadiens, Ducks, Kings, Sharks and Blue Jackets in their last 7 games. Reasons to bet Minnesota: The Wild just continues to roll, improving to 17-1-1 in its last 19 games with a 3-2 win in Chicago on Sunday. New Jersey has scored 8 goals in its last 6 games. Reasons to bet Florida: The Panthers are heating up a bit, beating Columbus 4-3 Friday to improve to 5-3-2 in their last 10 games. Calgary has scored 5 goals in its last 4 games. Reasons to bet Calgary: The Flames have held opponents to 2 goals or less in 7 of their last 8 games. Florida has lost 18 of its last 24 games when coming off a victory in its previous outing. Reasons to bet Chicago: The Blackhawks routinely beat up on losing teams, winning 39 of their last 54 games against opponents who are under .500. Colorado has lost 21 of its last 26 home games dating back to last season. Reasons to bet Colorado: The Avalanche beat Chicago 2-1 in OT Dec. 23 in Chicago. The Blackhawks have lost 2 straight and are only 10-9-1 on the road this year. Reasons to bet Nashville: The Predators have won 3 straight games, allowing just 4 goals in those victories. Vancouver’s lost 4 straight, although the last 3 came in OT or a shootout. Reasons to bet Vancouver: The Canucks are 15-6-3 at home this season. Nashville has scored 2 goals or less in 7 of its last 10 games. Reasons to bet Tampa: The Lightning opened a 6-game road trip yesterday with a 2-1 win in Los Angeles and has now allowed 6 goals in its last 3 games. Anaheim has scored 2 regulation time goals or less in 5 straight home games. Reasons to bet Anaheim: The Ducks are 7-1-2 in their last 10 games and 14-5-3 at home this year. Tampa’s been held to 2 goals or less in 5 of its last 7 games.